A couple years ago, I read ProBlogger: Secrets for Blogging Your Way to a Six-Figure Income, a book on all of the steps to monetize a blog, by Darren Rowse and Chris Garrett. I liked the book a lot, as Rowse and Garrett didn’t sugarcoat things. They were candid about how it is really a tough grind to produce a successful blog. So, it was great to see that they’ve put together a second edition of ProBlogger: Secrets for Blogging Your Way to a Six-Figure Income, and I just ordered it. The first edition may have been a little basic for experienced bloggers, but I think it was ideal for people breaking into it, and I useful volume of advice for the know-it-alls, too. Anyhow, I see it’s not a complete re-write, but I understand they’ve made a number of updates to make it current, including new examples, screenshots, updates of new tools, deletions of references to old tools, etc. It’s up in the online bookstores now – check it out if you’re a blogger. My run today was a personal record for a 5k race. 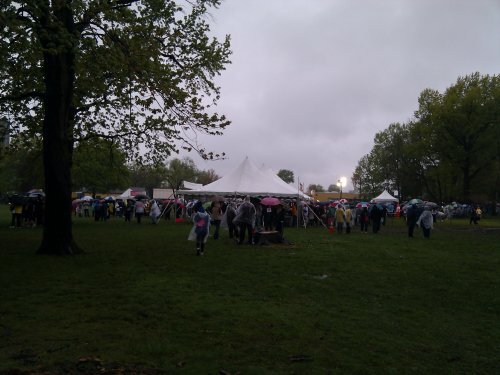 Maybe I should run in the rain more often. I am a big proponent in using content to build long-term affiliate sites, and I produce lots of my own original content on a regular basis, but that’s just not scalable for many sites. 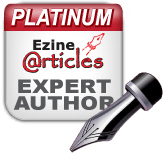 I’ve used EzineArticles for years to provide fresh content to sites, and I am an author on EzineArticles, too. That should be plenty if you’re just looking to supplement other content, but what if you don’t have time to produce your own material? I’ve been checking out Brafton, and I plan to try them out on some sites. If you are not familiar with Brafton, they are an online news agency that provides unique and exclusive news content written by in house journalists. LinkShare has released a new bookmarklet as part of the LinkShare Bento Box. The CouponSnap browser bookmarklet from LinkShare enables affiliates to get the latest coupons and offers from advertisers directly from the browser with the click of a button. Go to the CouponSnap page in the Bento Box, install your token and click the button. Note – affiliates must be approved for the Coupon Web Service to work with CouponSnap. Apply for access. Drag the CouponSnap text to the browser. Navigate to an advertiser site you are partnered with in the browser and click the CouponSnap bookmark. A popup window will come up with current offers from the advertiser’s site you’re on. 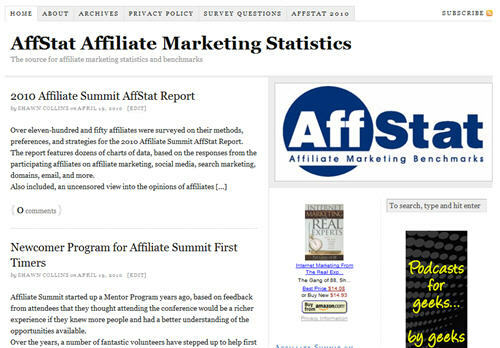 The 2010 Affiliate Summit AffStat Report is now available for free at http://affstat.com/. The report can be viewed online or downloaded. The report features dozens of charts of data, based on the responses from the participating affiliates on affiliate marketing, social media, search marketing, domains, email, and more. Plus, there are resources for affiliate marketers: a glossary to explain industry terms, as well as lists of suggested message boards and blogs you should know about. Feel free to use material from the report in blog posts, presentations, etc. Just reference that the information came from the 2010 Affiliate Summit AffStat Report. Below are the questions covered in the 2009 Affiliate Summit AffStat Report. Do you prefer network or independent affiliate programs? How many affiliate programs do you actively promote? How many return days for cookies would you consider to be fair? Do you own any domains dedicated to a particular affiliate program? How often would you like to hear from your affiliate managers? What industry/merchant types do you prefer to promote? What is the minimum EPC (earnings per 1 click) for you to promote an affiliate program? Do you cloak links (CGI, .htaccess, meta redirect, etc.)? What is your average gross monthly income with affiliate programs? Affiliate Summit is running a commercial for Affiliate Summit East 2010, taking place August 15-17 in NYC, overnight on a variety of news, finance, and sports shows in the second half of April 2010. The commercial touches on the uncertainties in the economy, and how folks can control their destiny by working in affiliate marketing and becoming their own boss. Affiliate Summit started up a Mentor Program years ago, based on feedback from attendees that they thought attending the conference would be a richer experience if they knew more people and had a better understanding of the opportunities available. Over the years, a number of fantastic volunteers have stepped up to help first time attendees find their way around Affiliate Summit, and the process has enabled countless connections. But there has been a reoccurring problem. Some folks understood a “mentor” to be somebody who would train or consult them. Each Affiliate Summit, there would be mentees who expected business coaching, and their mentors were put in a position where they wanted to help, but they weren’t equipped or didn’t have the bandwidth to dedicate themselves in that capacity – since that’s not what they signed up to do. So, we’ve changed up the name to be the Newcomer Program. No more mentors, but the same program with hopefully a clearer perspective of purpose. The Affiliate Summit Newcomer Program is provided to help first time attendees gain a better understanding of what to expect when attending Affiliate Summit. The volunteers offer their time and past experience knowledge to help newcomers optimize their time at the event. If you’d like to participate as a volunteer or you are planning on attending the show for the first time, sign up for the Affiliate Summit Newcomer Program today. buy.at Beta launched a new API (Application Programming Interface) yesterday that provides direct access for affiliates to full scale product feed data in real-time. The API also enables affiliates to create deeplinks directly from the Firefox browser.